Abstract: This paper frames the recent ABET accreditation model with respect to the balance between IS programs and innovation. With the current relaxation of the content of the information systems requirement by ABET, it is possible to include innovation into the accreditation umbrella. To this extent this paper provides a curricular model that provides programmatic flexibility within the information systems environment that allows for innovation in the context of an accredited program. An innovative bachelor’s degree program incorporating cyber forensics and information security is presented which can fit the ABET-CAC model for accreditation as an Information Systems degree. 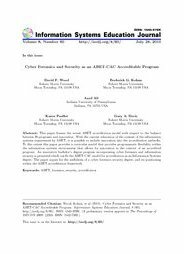 The paper argues for the usefulness of a cyber forensics security degree, and its positioning within the ABET accreditation framework.